With his company in residence at Trafalgar Studios, Jamie Lloyd has been enticing young audiences to his shows with a successful formula: updated classic text, plus cool Generation Netflix telly stars, multiplied by designer Soutra Gilmour’s music video aesthetics. Add in a cheap ticket scheme (£15 Mondays), and you have an admirable audience development strategy. For Doctor Faustus, he moves his model into the much larger Duke of York’s Theatre, where Colin Teevan’s 2013 update of Marlowe’s text sees the protagonist make his pact with the devil in order to become a modern day celebrity magician. 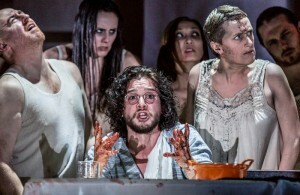 The telly star of choice is Kit Harington from Game of Thrones; the press night of this production was cannily timed to coincide with its latest season premier. Alongside Lloyd and regular collaborator Gilmore, Polly Bennett is movement director, Ben and Max Ringham look after sound and music, and Scott Penrose creates special effects. Joining Harington onstage are Jenna Russell, Jade Anouka and Tom Edden. Megan Vaughan rounds up the reviews. Kit Harington’s central turn disappoints some critics and impresses others. While Dominic Cavendish (The Telegraph, ★★) thinks he remains “stubbornly earthbound”, Leslie Felperin (Hollywood Reporter) praises his “confident, charismatic performance”. While Michael Billington (The Guardian, ★★) finds in him “a sense of Faustus’s flailing despair”, noting that he’d like to see the actor take on more classical roles, Holly Williams (WhatsOnStage, ★★) says, quite simply, that he “cannot carry this play”. Jamie Lloyd’s production is characteristically visual and packed with gory effects, but reviewers don’t always agree on their success. Dom O’Hanlon (London Theatre, ★★★) refers to the show’s “heavy white noise”; for Dominic Cavendish it becomes “completely incomprehensible”; while Henry Hitchings (Evening Standard, 2 stars) diagnoses “a case of less Marlowe and more Marloverkill”. Jenna Russell as Mephistopheles, on the other hand, is “marvellously understated”, according to Paul Taylor (Independent, ★★★). For Danny Coleman-Cooke (British Theatre, ★★), she was “way more powerful than a lot of the carnage developing around her”, and Dom O’Hanlon says her interval karaoke was “worthy of its own full production”. Holly Williams sees the other side of that coin though: “A fine actor, she seems at sea in this rudderless show”. Doctor Faustus – So is it any good? Other writers note an inherent hypocrisy at the heart of this production, with Leslie Felperin, Holly Williams and Marianka Swain all questioning how a show so critical of celebrity culture can get away with putting a hot young TV star on stage for two hours in little but his pants.